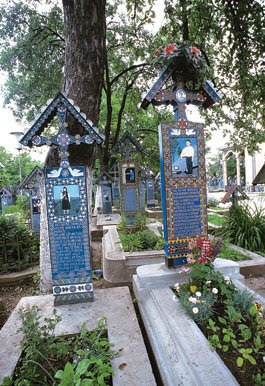 The worldwide fame of Sapânta is due to the unique cemetery that has become an important tourist attraction. Some days the throngs of tourists that assault the cemetery with their cameras ready make one wonder if it really is possible to rest in peace here! The original character of the cemetery is first of all suggested by its name: Cimitirul Vesel that means The Merry Cemetery. 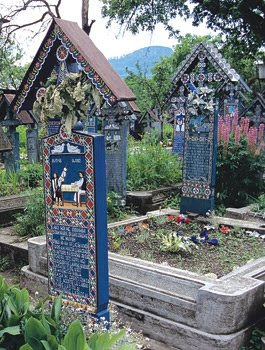 This paradoxical name is due to the vivid colours of the crosses and the amusing or satirical epitaphs carved on them. It is said that this joyful attitude towards death is a legacy of the Dacians who believed in the immortality of the soul and that death was only a passage to a better life. They did not see death as a tragic end, but as a chance to meet with the supreme god, Zalmoxis. The cemetery dates back to the mid-1930’s and is the creation of the local folk artist Stan Ioan Patras, sculptor, painter and poet rolled in one. Patras used all his skills to create this masterpiece. For half a century the master created hundreds of wooden crosses, carved in a distinctive style, so famous today. After his death in 1977, his work has been carried out by his apprentice, Dumitru Pop Tincu. The material used for the crosses is oak, which, after being properly cut and dried, is carved by hand. On the upper part of each cross is a bas-relief with a scene that describes the life of the deceased. The scenes are simple and naïve in style, but have an undeniable power: they bring back to life the inhabitants of the village and present their main occupation or a relevant aspect (either a virtue or a flaw) of their life. There are women spinning wool or weaving rugs, housewives baking bread, men cutting wood, farmers ploughing the land, shepherds tending their sheep, carpenters working the wood, musicians playing their instruments, butchers chopping lambs, teachers at their desks, alcoholics drinking, and so on. After the carving is done, the cross is painted. The background colour is a distinctive vivid blue, called “Sapânta blue“. Then the scene and the geometrical and floral decorations of the borders are painted with vibrant colours, yellow, red, white and green. Underneath this heavy cross Lies my mother-in-law poor Had she lived three days more I would be here and she would read You that are passing by Try not to wake her up For if she comes back home She’ll bite my head off But I will act in the way That she will not return Stay here my dear Mother-in-law. So hard was my life in it. In the earth I rot. 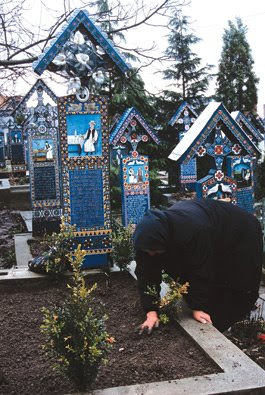 With these images and the short poems, Stan Ioan Pătraş and Dumitru Pop Tincu have managed to recreate the entire village at the cemetery and give the people a second life beyond the grave. 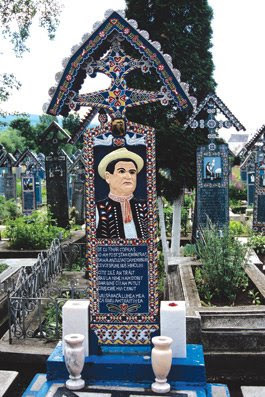 The more than 800 painted crosses constitute a vast archive that preserves, carved in wood, the stories of the people of Săpânţa.